Welcome to my latest ongoing series: Spielberg Summer. It will be occurring sporadically throughout the summer in conjunction with DC's The Good, The Bad and The Magnificent. We'll be looking at all Spielberg's films to try and examine his long term success. Be sure to check out our reviews of Spielberg's Lincoln (DC's and mine) and continue reading as we explore his whole filmography. Duel (1971) is the first feature length film by director Steven Spielberg. It started as a TV film on ABC, but was later lengthened and re-released for theaters. A man sets out on his long drive home. He's in high spirits and enjoying a program about tax returns on the radio. Soon he gets behind a truck as it moves slowly up a mountain. He passes it and continues. The truck soon appears behind him and tailgates him. After letting him pass, the truck slows down and blocks him. This begins a cat and mouse chase through the deserts of California. Duel has some fantastic direction with its tense car chases and imposing truck scenes. 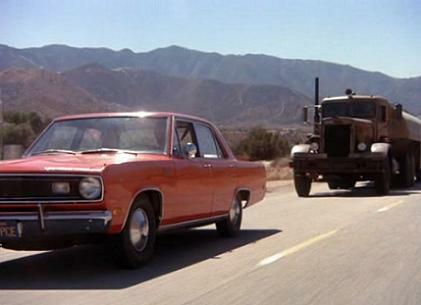 Several of the car vs. truck scenes are quite inventive and superbly filmed. 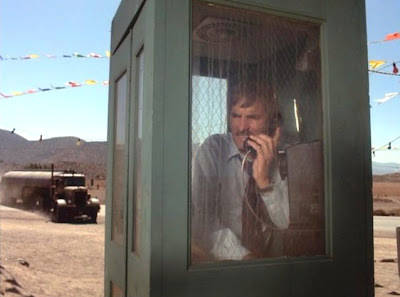 However, quite a lot of this film is just driving through the desert, which can get a bit monotonous. There is also a diner section at the middle that lasts a bit too long and has some dreadful voice-over internal monologue that would have been better off left out. David Mann is a business man who's trying to get home to his family. He's far from a perfect individual and can be a bit of a hothead. His internal monologues appear out of nowhere during the aforementioned diner scene and appear for a bit afterward. It isn't actually the fault of the actor, Dennis Weaver, his paranoia would have probably worked had the scene remained silent. His final break before fully committing to the duel is definitely one of the film's highlights. Proto Jurassic Park T-Rex Scene! 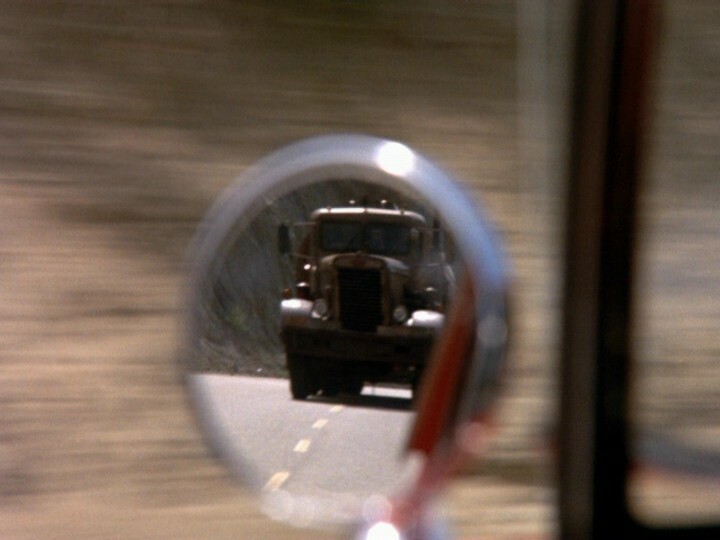 The truck and its mysterious driver are menacing in the best possible way. If you've seen Jaws then this aspect should be familiar in the mysterious nature of the shark. The fact that we never see the driver makes him all the more menacing. The feel of driving long distance through the California desert is perfect. Just the long stretches of highway and the radio. While this does get a bit lengthy at sections, it doesn't go too far. The end is pretty much to be expected. It was satisfying and climactic. 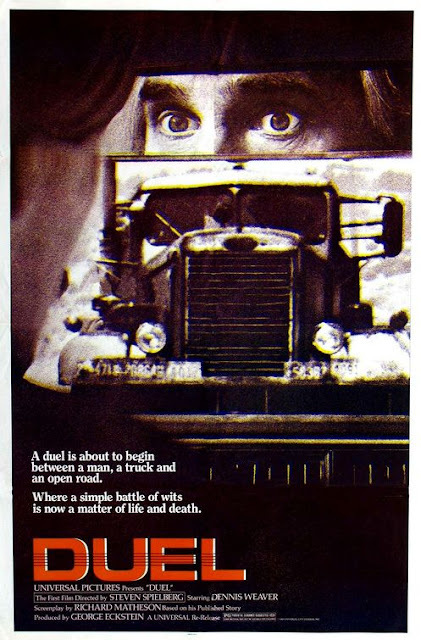 Duel is most definitely a product of the early seventies, though not in a bad way. There are a few misfires, like the diner scene, but this a film that shows plenty of Spielberg's future greatness. I'd recommend it if you enjoy car chases or want to see the film that gave Spielberg the opportunity to make Jaws. Next up, we look at Spielberg's second TV movie: Something Evil.